This is a reminder for our readers in the Bay Area that the "Rorate" Mass of the Wednesday Ember Day of Advent will be celebrated as a Solemn Mass of the Dominican Rite at Our Lady Star of the Sea Church in San Francisco on December 18 at 6:30 p.m. The students of the Western Dominican Province will serve this Mass, which will be sung by the scholar of the Traditional Latin Mass Society of San Francisco. The celebrant will be Fr. Anselm Ramelow, O.P. As the Ember Day Mass is penitential, this is a opportunity to see a number of unusual traits of the ferial/penitential Dominican Solemn Mass, for example, the deacon and subdeacon do not wear dalmatics but, over the alb, only the maniple and (for the deacon) the stole. Then, on December 25, the Solemn High Dominican Rite Mass of Christmas Day will be celebrated at the Carmel of the Holy Family in Canyon CA. The celebrant will be Fr. Augustine Thompson, O.P. Western Dominican Province students will serve and the Propers and Ordinary will be sung by the nuns. 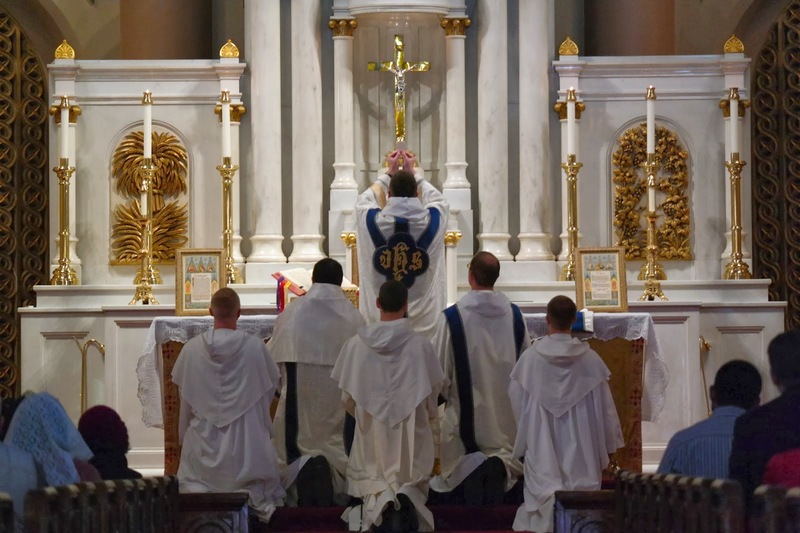 In the Dominican Rite, this Mass has three readings and includes the famous sequence Laetabundus. Driving directions and information on other up-coming Dominican Rite Masses in the Bay Area may be found here.